Nature’s prehistoric upthrust of the Red Rocks area began some 70 to 40 million years ago with a geological event called the Laramide orogeny. Of the numerous formations, sharp-angled Creation Rock is the giant that attracts the most attention, towering 500 feet from its base. To the left, forming what boosters used to call “the Gateway of Heaven and Earth,” is Ship Rock, which at night looks like a gigantic ocean liner. 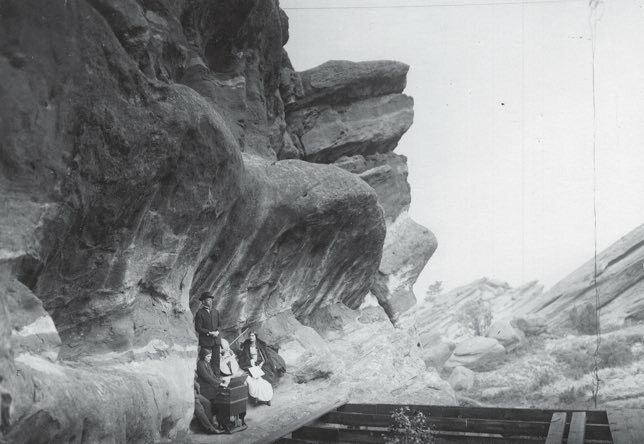 In 1911, opera star Mary Garden became the first nationally renowned musical act to give a concert at Red Rocks, then christened Garden of the Titans. 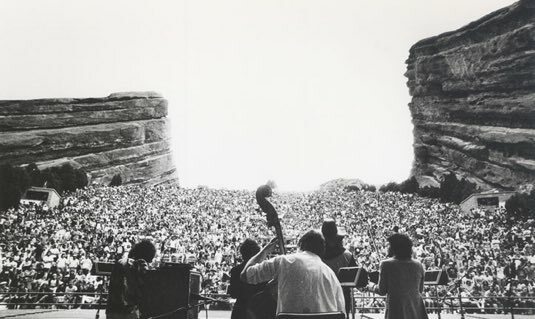 Before long, Red Rocks came to be considered one of the Natural Wonders of the World, with numerous opera companies and orchestras taking advantage of the site’s unique combination of natural aesthetics and acoustics. By the 1950s, solo artists began to appear regularly. Red Rocks Amphitheatre as we know it was constructed from 1936 to 1941 by Civilian Conservation Corps (CCC) youths, with an assist from the Works Progress Administration (WPA), which built roads and parking lots. The CCC was Franklin D. Roosevelt’s pet project in pushing anti-Depression New Deal legislation. The workers dynamited, dug, embedded structural steel, and then reshaped stone and tiers of concrete seats over it. Red Rocks Amphitheatre is heralded as America’s most important outdoor music venue, and every star in the musical galaxy has aspired to play on this special and magical stage. Among the highlights is the legendary Beatles show in 1964, Bruce Springsteen’s first-ever outdoor concert in 1978, and U2’s career-making 1983 video shoot. Red Rocks Amphitheatre is heralded as America’s most important outdoor music venue, and every star in the musical galaxy has aspired to play on this special and magical stage.